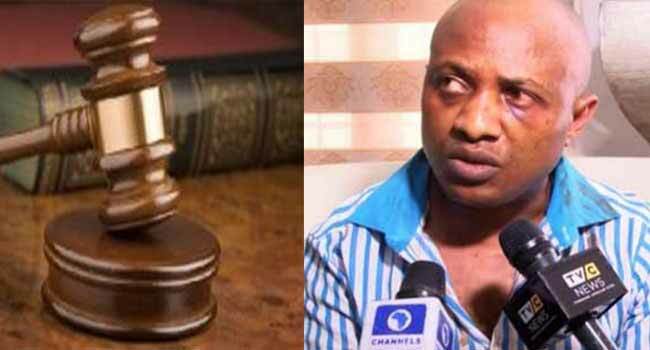 The Lagos State High Court, sitting in Igbosere area has again dismissed an application seeking to quash the charge preferred against suspected kidnapper, Chukwudumeme Onwuamadike, popularly known as Evans. Evans is facing two different charges before the court. In the first, he is charged alongside three others: Joseph Emeka, Ugochukwu Nwachukwu and Victor Aduba on five-counts bordering on conspiracy to kidnap, kidnapping and attempted murder. Evans, however, asked the court to quash the charge. In his application, the defendant (Evans) had said that ‎all the counts in the charge were “grossly defective, repetitive and an abuse of court processes”. At the resumed hearing today, Justice Akintoye noted that the processes filed by both counsels to the case identified three major issues for determination. “Whether a prima facie case has been established, whether the charges are incompetent and whether the court has jurisdiction to entertain the charge,” she said. Akintoye added that for a prima facie case to be established, the proof of evidence must sufficiently link the defendants with the offence. She said, “looking closely at the proof of evidence, a prima facie case has been established. “The statement of one of the victims stated that Evans shot him with a gun, cleaned the wound by himself and asked the third defendant to look after him (victim)”. The judge also held that the charge was not an abuse of court process, adding that every distinct offence should be charged separately. She, however, stated that the information did not offend the rule of duplicity as enshrined in Sections 152 and 153 of the Administration of Criminal Justice Law (ACJL) of Lagos State. Akintoye said that the charges were not defective nor an abuse of court process, “the charge disclosed different offences with different facts, different victims and different places”. She also said that the defendant did not prove that there was any miscarriage of justice in the charge filed. She said on the issue of whether the court has jurisdiction, the argument was that the court has the power to quash charge. She, however, held that the application to quash charge was premature. “The defendant must wait until the close of prosecution’s case before filing to quash charge, the application to quash charge and to discharge the defendants is hereby refused and dismissed. “The application lacked merit, I so hold,” Justice Akintoye ruled. After the ruling, the prosecutor, the Lagos State Director for Public Prosecutions (DPP), Ms Titilayo Shitta-Bey, said in view of the ruling, the Govt wants the defendants to be arraigned. The defendants (Evans is being tried alongside Joseph Emeka, Linus Okpara and Victor Aduba) were promptly arraigned on five counts for allegedly conspiring among themselves to kidnap one Chief James Uduji, and for collecting a ransom of $1.2 million dollars and for attempts to murder the man. The defendants allegedly committed the offences on September 7, 2015, at Seventh Ave. Festac Town, Lagos. The charge also stated that the defendants while armed with firearms attempted to kill another Mr Donatus Nwoye by shooting him on his hand. It also stated that the defendants attempted to kill one Mr Jereome Okezie by shooting him also on his hand and head. The offences contravene Sections 230 (A) and 411 of the Criminal Law of Lagos State, 2015. The defendants, however, all pleaded not guilty to the charge. Before the ruling, the judge acknowledged that Mr Olukoya Ogungbeje, the lead counsel to Evans wrote a letter to the court withdrawing from the case. However, another lawyer, Mr Noel Brown announced his appearance as Evans’ new counsel. Justice Akintoye has further ordered the remand of all the defendants in prison and adjourned the case until Sept. 13 for trial.